Conil de la Frontera boasts over 14 kilometres of vast beaches spread across 6 locations, all of which feature golden sand and crystal waters. With breath-taking scenery, stunning beaches, fascinating culture, great weather and delicious food, it’s not hard to see why Malaga is so popular. Situated in the province of Huelva in western side of Andalucia, El Rompido is one of the most uncrowded spots along Huelva’s Costa de la Luz. The beautiful town of Estepona, nestled between the Sierra Bermeja mountains and the Costa del Sol coastal strip, is an exceptional destination for a family holiday. 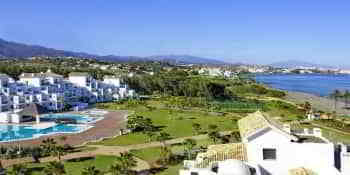 Marbella is a resort town on the southern coast of Spain. Marbella is regarded as Spain’s answer to St Tropez thanks to the wealthy visitors it attract and luxury lifestyle it offers. Located in the heart of Andalucia, one of the most important natural parks in Spain. Aside from its multitudes of flora and fauna and stunning landscape, the areas also boasts rich traditions and some of the lovely villages in all Andalucía. Sun, beach, nature and varied cuisine appreciated worldwide, as well as the open and joyful nature of Andalusia’s people, are some of the main reasons for visiting the different destinations offered by Fuerte Hoteles, a true holiday paradise. Fuerte Hoteles always surprises with its exceptional locations, which is why we invite you to discover our destinations, where we offer you a bespoke holiday experience, regardless whether you come with your family, partner or in a group. Marbella is a whole world away from the Costa del Sol, a city that is synonymous with luxury, relaxation, golf, wonderful beaches and exquisite gastronomy. Marbella is the perfect mix of modern and traditional aspects, where exuberant subtropical gardens and fine sand beaches combine perfectly with the glamour of Puerto Banús and its Golden Mile. It is not for nothing that Marbella is a five star destination. 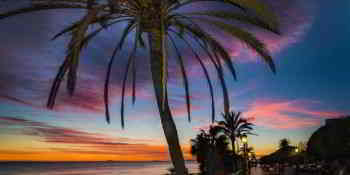 Estepona is much more than just a town with sunshine, beach and mountains on the Costa del Sol. Visiting Estepona is just like visiting a gigantic garden with streets lined with potted plants, green spaces full of little plants and now, the star tourist attraction, the largest Botanical Gardens and orchid collection in Europe. White, pollution-free and with a lapping sea: landscapes, monumental beauty, history and identity, all in “Europe’s best climate”. 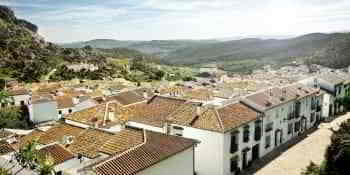 Torrox Costa offers a curious combination of beach and mountain, rural Andalusian charm and a privileged location from where both Granada and Málaga can be enjoyed. Conil is a world open to water sports and relaxation, where you can enjoy freshly fried fish, shellfish and sherry on well-known beaches such as La Fontanilla, where visitors await the moment the sun dips below the horizon to applaud one of the most beautiful sunsets on the Costa de la Luz. 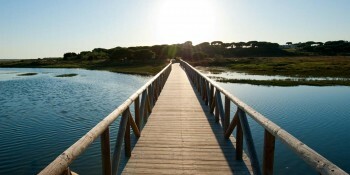 At El Rompido you can explore the cultural and natural wonders of Huelva’s Costa de la Luz, a region to be discovered that is ideal for enjoying a round of golf, a sunset, a Spa treatment or a nice glass of wine while you sample the catch of the day. 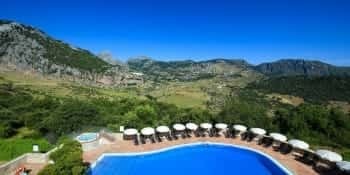 Grazalema is an ideal place to relax and contemplate the incredible views of its natural park, or enjoy wonderful backdrops while playing sport in the open air, while you take in nature in all of its splendour. Fuerte Hoteles offers the best installations, designed in detail to make your holiday with us as pleasant as possible. The best design and all facilities for meeting the expectations of 21st century travellers. On holiday, everything is possible!